At first I thought this article would be a lighthearted, even amusing account of how to wear your clothes in many ways. However, my recent insights into the horrors of ‘fast fashion’ has drastically changed my opinion on how we dress, and on a deeper level – how we understand happiness. In case you don’t know what fast fashion is, it is the fashion produced by major high-street brands we love, because of their affordable prices and ever-growing collections. “This is so me!”, is what we tell ourselves when we see something we like in stores and that is usually enough for us to make a purchase. It’s fun to shop and it’s convenient to buy things ready-made, but who is making the clothes? Have you ever thought about that? Our clothes have a daunting past – before the heavy marketing campaigns, social media infiltrations and chic store displays. In fact, it involves underpaid workers in developing countries working in harsh and even toxic conditions for long periods of time. All that, just for nice clothes? Moreover, once bought, do we really give those pieces of clothing the same appreciation as we did when they were hung up in store? Not always. Do we need so many clothes, not at all! The balance between retail therapy and the manufacturing process is what is in danger, now making it easier for us to buy lovely clothes, but at a much higher cost for the people stitching them. It’s not my intention to turn you off shopping, however, as a blogger/influencer, I feel like it’s our duty to make people aware of what’s really happening around them (to the best of our ability). As customers we have the power to demand, so do it, become conscious when you’re going to the mall, and support brands that care about people and our planet. Some top designers manufacture their products in the same factories as low-cost brands, how does that make you feel? A bit cheated? You are promoting a designer bag every time you step out of your house wearing it, so support the good and the rest will follow. If you want to learn more about fast fashion, watch the documentary called, “The True Cost”. Liven up an old shirt by cutting about 5 inches off the bottom and make it into a cropped shirt. These look super cute in my opinion. Pair this with some high-waist-ed trousers or shorts. You can even do this with an old T-shirt of yours. Cut your old jeans into shorts instead of buying a brand new pair. Fold the pants so that both the leg bits are stacked one on the other, and cut diagonally making sure that the back is at least an inch and a half longer, you can also get the seam stitched to prevent fraying. Want to be more creative? You trace any shape you want (scallop shorts anyone?) onto the pants and cut accordingly. This is pretty simple, chop off the sleeves and hem the frays in place. To hem, fold the cloth twice so that the edge is completely smooth and then give it a simple stitch. Nowadays in fashion anything goes, so skip the hemming step if you’d like and no one will know it’s a DIY. Instead of buying new jeans, ask your mom to give you some of her old trousers or jeans. Alter them at your local tailor and voila! You’ve just saved at least 2000 rupees and you also have a unique pair of trousers. You can do the same for other clothing belonging to any member of your family, don’t forget to ask for permission though! Take one of your cold shoulder blouses and trace it onto a plain t-shirt and cut out the necessary areas. When you get bored of this trend, cut the rest of the sleeve off and you’ll have a sleeveless top. There are several tutorials on YouTube that teach you how to bleach jeans, follow it and give your old jeans a new look. You may have a friend who is gifted in the art space, tell him/her to paint an old t-shirt, giving you a new, one of a kind graphic tee. Alternatively, you can make DIY stamps and create a print or pattern on your t-shirts. Patches are trending, buy some from HM, or online stores like amazon, Koovs and Myntra and stick away. Choose patches that you can relate to so you don’t get bored of the clothing when the trend is over. These look great on motor-bike jackets, jeans and satchels. Alternatively, look out for badges, these were really popular in the 90s and could make a return to the fashion world soon. These are usually attached on the straps of bags for a personalised touch. Wear your shirt around your hips (tuck the collar inwards) and button the shirt all the way down, then wrap the sleeves around the shirt (now skirt). You can add a belt for fitting and tucking purposes. This style is a bit out there, so save it for a music festival or when you’ve run out of things to wear on holiday. 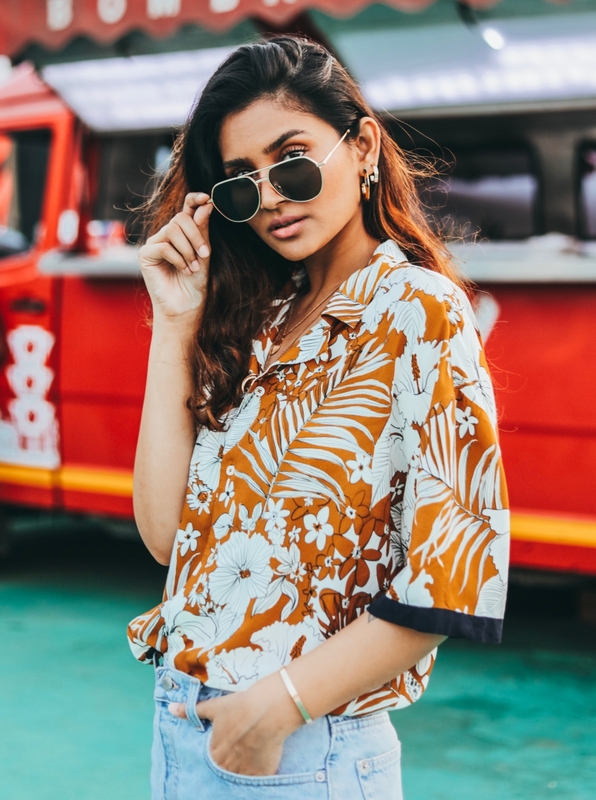 Instead of buying one more off shoulder top this season, covert your shirt into an off-shoulder top by pulling the sleeves down, you can wear it backwards for an edgy look. This may not work with all your shirts, so keep trying and you may find the right one. I have done this clothes hack many times, especially with body-hugging skirts. Give your old skirt a new life by making it into a tube top. If you don’t want to cut your dresses, wear a t-shirt or sweater over it to make it appear as a skirt. Tell us in the comments section if you have any clothing transformation tips, or if you’ve tried any of the techniques written above. Recycling or up-cycling clothes can be a fun project for your creativity and will also benefit the exploited workers churning out clothes every day.